Summer is limping along here (it is currently 63 degrees and cloudy), but I remain determined to make the most of whatever warm weather we are granted over the next month or so. Though I have yet to really feel as though we have experienced a proper summer thus far, I have, at least, done a good job of pretending it’s truly summer by grilling as much of our food as humanly possible. I’ve always been a fan of grilling, but this summer has been a particularly active one in terms of experimentation and learning. In just a couple of months we’ve tackled smoking both salmon and ribs, and we’ve taken to grilling fruit, corn, and, most recently, pizza. In yet another story of I Was Told This Would Be Difficult, grilling pizza was always presented to me as a specialized activity that would require the use of either a pizza stone (which we no longer have), or a cast iron pan (which we do have, and I did try, but, um, let’s just say that while I am a fan of blackened catfish, I am not, as it turns out, a fan of blackened pizza). I think the problem with many grilled pizza tutorials is that the end result is meant to mimic that of a wood-fired pizza oven, and, though admirable in its reach, that’s one extremely tall order that might be best left to real, actual wood-fired pizza ovens. 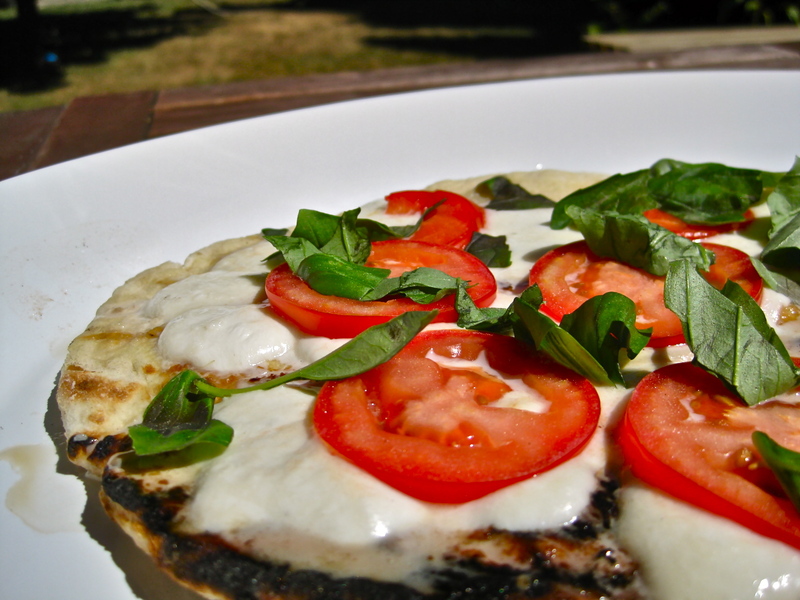 In more heartening news, I have discovered that grilling a pizza is not so different from grilling naan, which I always, weather permitting, prefer to cook on a screaming hot outdoor grill rather than in a screaming hot oven in my kitchen (where my child loves to run around, throw things, and—dear lord, I can taste the danger just typing this). As with smoking things on a grill, the secret to grilling a perfect pizza lies in the utilization of indirect heat. Once you initially cook one side of your pizza dough on the heated side of the grill, giving the dough a great crunch, you flip your dough over onto the unheated side of the grill, load the dough up with toppings (less is always better here, since the logistics of grilling a pizza are a bit fussier than just cooking a pizza in your oven), then wait a short 5 minutes, slide the dough back over to the heated side for a final blast of heat (this ensures a fantastic crispness), and you’re done. Standing outside, in front of your grill, the scent of browning dough wafting through the air, you really feel the essence of summer’s casual buzz. In reality, grilling a pizza takes just about the same amount of time, give or take a minute or two, as cooking a pizza in the oven, but the end result is something a bit more rustic, a bit more special. 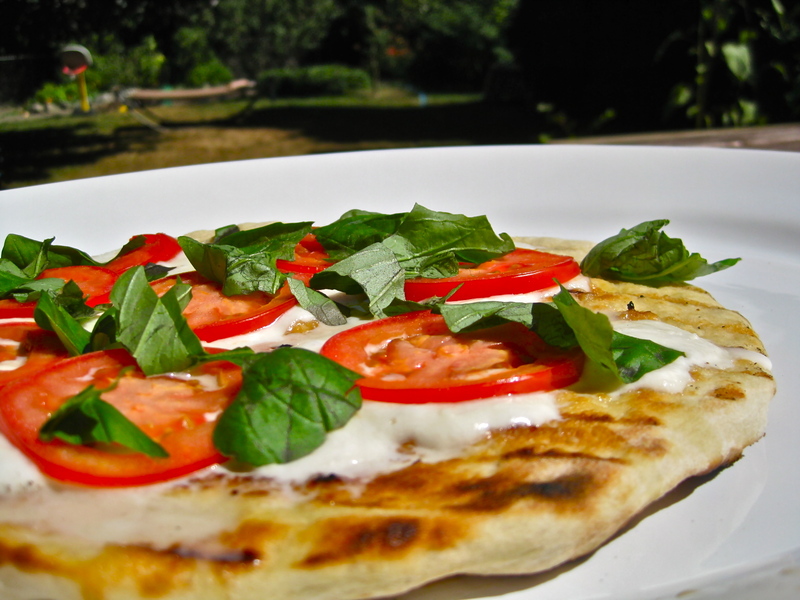 Your pizza will have a fantastic flavor, your dough an unparalleled crispness, and your summer a little more pleasure. Set up your grill for indirect cooking. I talk a bit more about indirect grilling here, but basically what you want to do is heat one side of your grill on high heat, and leave the other side unheated. Thoroughly oil the grates of your grill. Combine the garlic clove and olive oil and set aside. Prepare all of your ingredients and have them set up within close proximity to your grill. 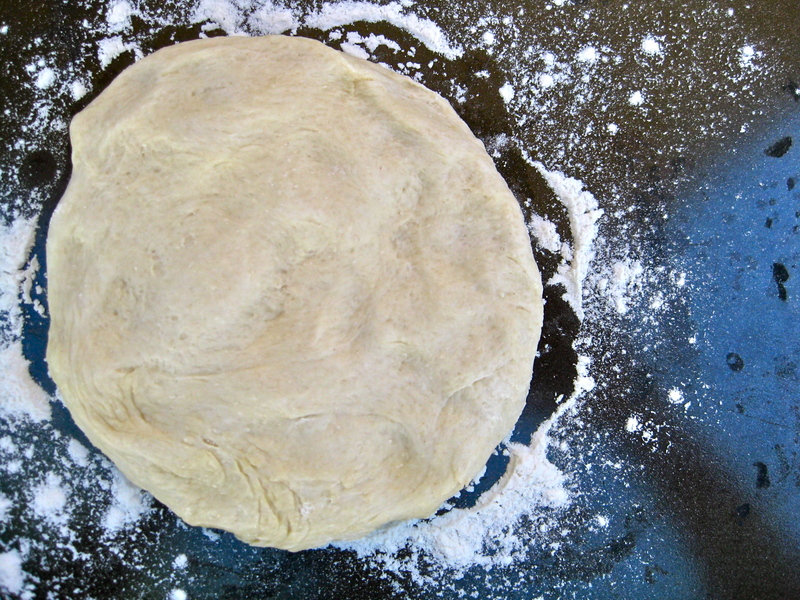 Using your hands, never a rolling pin (flattening out pizza dough with a rolling pin forces all the air out of the dough and makes it tough), stretch out your pizza dough until it resembles a circle roughly 12 inches across (if it’s not a perfect circle, don’t worry). When making a pizza outside on the grill, I like to stretch my dough out on a well-floured baking sheet, as it contains the flour mess and helps make clean up exceptionally easy. 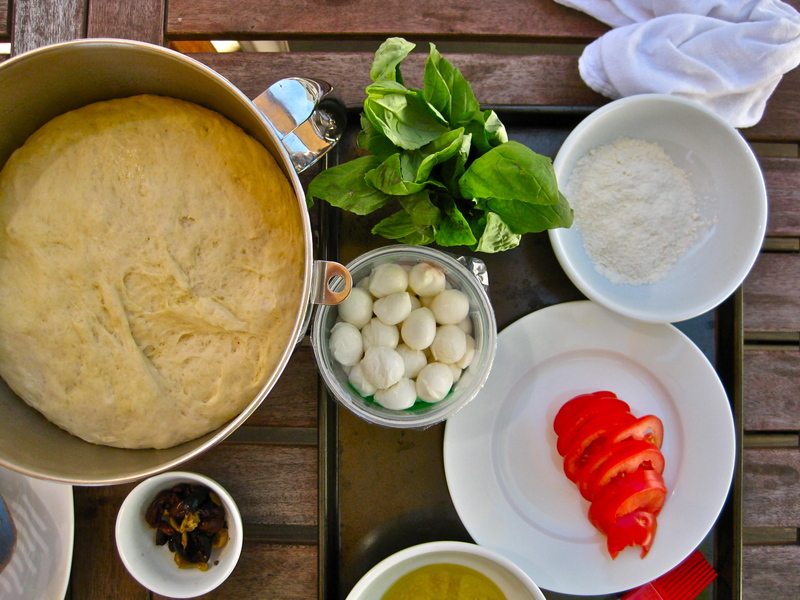 Brush the top of the dough with your garlic and olive oil mixture. Place your dough, garlic and oil side down, on the heated side of the grill. 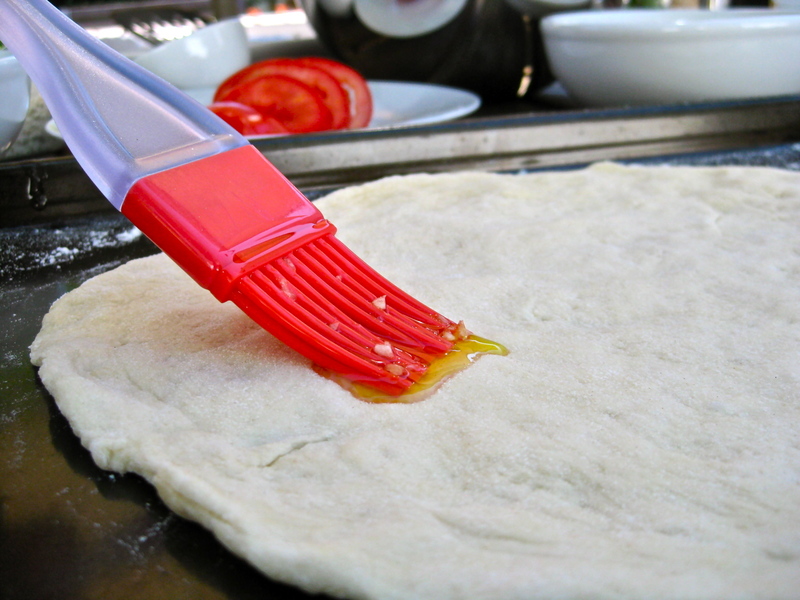 Allow the dough to cook for 1 to 2 minutes, until the dough starts to bubble and the bottom, when lifted, has visible grill marks. 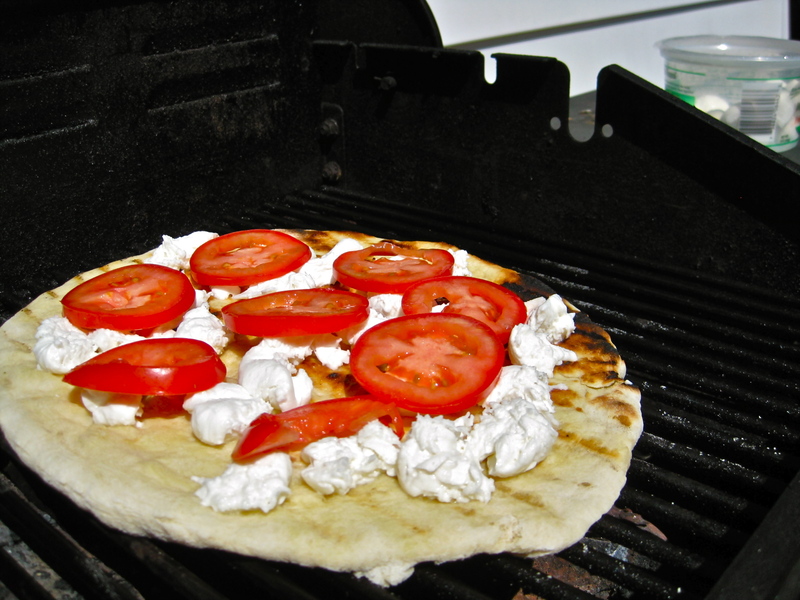 Using a metal spatula, flip your dough over, garlic and olive oil side up, onto the non-heated side of the grill. Pinch off pieces of fresh mozzarella and place them onto the top of the dough, then intersperse tomato slices around the mozzarella. Close the lid of the grill and allow the pizza to cook for 5 minutes. After 5 minutes, open the lid of the grill and check on the pizza. The cheese should be melted (keep in mind that it will not be slightly browned as when you cook a pizza in your oven), and the edges of the dough should look dry and crisp. If the cheese has not melted or the pizza looks especially wet, close the lid once more and allow the pizza to cook for another 1 to 2 minutes. When the cheese has melted, slide the pizza back onto the heated portion of the grill. Let the pizza cook for 1 minute, until the underside is super crisp and just on the verge of turning black. 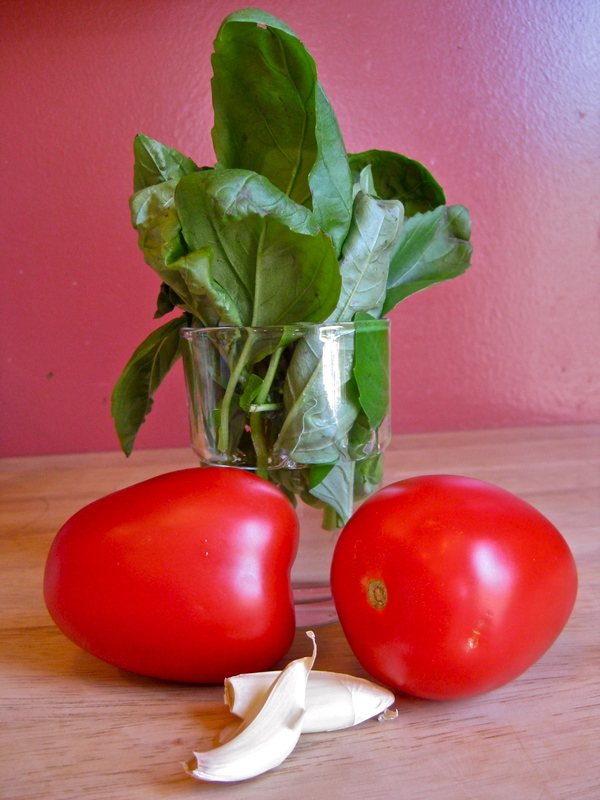 This will give your pizza crust an incredible crispness and deep flavor. Remove the pizza from the grill. Tear up the basil leaves and scatter them on top of the pizza. Cut pizza into slices and serve immediately.